Change the playlist name, album name, genre, and track order of the current playlist. You can also delete tracks, playlists, and albums. 2. Rotate to select Edit/Delete, then press . 3. Rotate to select Albums, then press . 4. Rotate to select an album that you want to edit or delete, then press . Rotate to select Edit Name, then press . - Enter the name using the interface dial or the On Demand Multi-Use DisplayTM. To delete an album: Rotate to select Delete, then press . 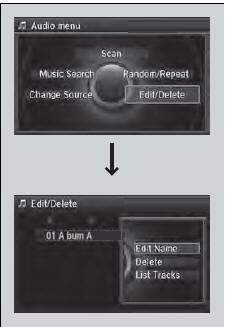 To edit track information or delete a track: Rotate to select List Tracks, then press . The maximum number of songs in each of the six user playlists is 999. Adding new songs overwrites the oldest songs. The maximum number of original playlists is 999 with a maximum of 99 songs in each playlist. Each album CD counts as an original playlist. Adding a track from a user playlist into the same user playlist will cause the track to appear twice in the playlist. Deleting an album (original playlist) also deletes the album tracks you have stored in any user playlists. Deleting a user playlist or deleting all tracks from a user playlist does not remove the playlist folder. The folder retains the playlist name and artist information. 3. Rotate to select Playlists, then press . 4. Rotate to select a playlist that you want to edit or delete, then press . Rotate to select Delete, then press . Rotate to select List Tracks, then press . 4. Rotate to select Create New Playlist, then press . - Enter the name using the interface dial or the On Demand Multi-Use DisplayTM, then select tracks from the Music Search list.